5.How do I know if I need reverse numbering? 6.What is "Number of Signature Lines"? For Standard, Voucher, Binder and Manual checks, the First Check number can be three to six digits long. Wallet checks can be three to four digits long. what is the purpose of the check number? 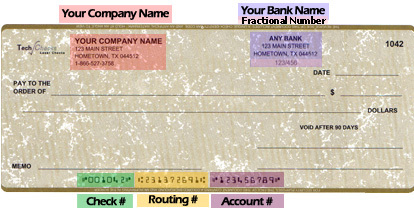 The check number helps you keep track of your checks. It normally appears in the upper-right corner of the check, and it's also printed in magnetic ink in the account line along the bottom of the check. See Image This enables the bank's check-processing equipment to capture the number electronically and print it on your statement. Check numbers also allow you to locate a particular check if you wish to stop payment. Please do not include any spaces or hyphens in your account number. If your sheet-fed (i.e., laser, inkjet, or bubble jet) printer loads from the front, you may need to request reverse printing. Mark a sheet of paper on one side. Load the sheet into your printer, marked side up. You have the option of adding an additional line for a second signature on your checks. Click the appropriate radio button to select the desired number of signature lines. You may add your custom logo free of charge. Please email it to logo@techchecks.net in a bmp. Tiff. Or jpeg file. Be sure to include the name on the check and your order number in the subject area. (You will be given an order number when you checkout). If you plan on using these checks for manual use also, check off this option. When ordering a starter packages you have the option to choose from any of the style checks that we sell. For Business checks you can choose from Top of page, Middle of Page, Bottom of page or 3 on a page. For Personal / Wallet size checks there is only one option, Personal - 3 on page.